When it comes to things to do in Orlando, we're pretty lucky. Besides all of our wonderful amusement parks, we've got tons of events that come through the area as well as our very own Basketball team, the Orlando Magic. The Magic play at our state of the art Amway arean, one of the most technologically advanced arenas in the world. And you don't have to be a basketball fan or even a sports enthusiast to enjoy an Orlando Magic game at an arena. After it's was re-built in 2006, it's now considered best in class in North America. There's a wide variety of seating to accomadate every guest. Our favorite is there club seating. I love the feeling like I'm sitting at a bar, enjoying a cocktail and appetizer. But wait, I'm also watching a great basketball game, it's incredible! The basketball games aren't just about the basketball either. From an electrifying light and video show, to halftime performances that will amaze, you’ll be on the edge of your seat through it all. Up-tempo music and non-stop contests and videos round out the game, making it an adrenaline-filled experience. It's a huge party at the Amway! Before heading to the Magic game, you can stop by Amway Center’s outdoor bar, ‘Ronas & ‘Ritas for Happy Hour every Wednesday home game for some Mid-Week Magic. Amway is THE place to be on Wednesday nights. 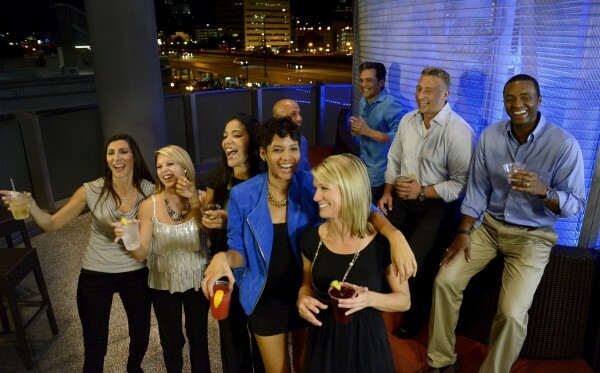 Bring your friends and enjoy drink specials and live entertainment from 5:30 – 7:00 then stay for the Orlando Magic game! Drink specials start at just $3! Game ticket required for access to Happy Hour. You can find Orlando Magic ticket Information here. Don't forget to also check for upcoming theme nights and promotions here.